Celebrating another successful livestock auction at the Pennsylvania Farm Show are (top, from left) Cabot Oil & Gas external affairs coordinator Bill desRosiers, Susquehanna County 4-H members Katelynn Supancik, Kayleen Conklin, Jamie Supancik, and Tommy Gudykunst, and state Rep. Jonathan Fritz. 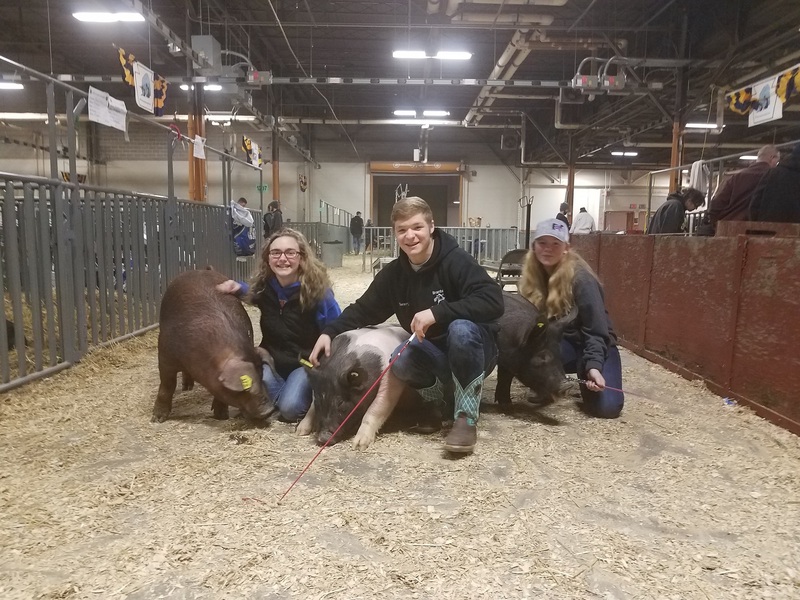 Above, (from left) Jamie, Tommy, and Katelynn show off their prize hogs at the Farm Show. Susquehanna County 4-H members enjoy a lot of support from the community. At this year’s Pennsylvania Farm Show, local youths found representatives from Cabot Oil & Gas ready and waiting at the auction block once again to purchase pigs. They also found a friend in PA State Rep. Jonathan Fritz, who was their to congratulate them for their successes, which included scholarship wins. Penn State junior Jamie Supancik, who was also interviewed by Fritz for his Facebook page, has been involved with 4-H for the past 10 years. For the Supanciks, 4-H has become a family affair, with her father, Robert, leading the way, and her sister, Katelyn, following in their footsteps. Blue Ridge High School junior Kayleen Conklin was also led to 4-H by the family members who preceded her, but it was Jamie who encouraged her participation in the Farm Show. She maintains her involvement with 4-H “because of the large variety of projects available and because of the many lessons I continue to learn through it,” Kayleen explained. “This was my second Farm Show, and I was really excited that Cabot bought my market hog,” said Tommy, who is in a dual enrollment program that allows him to finish high school while also earning college credits at the Lackawanna College School of Petroleum & Natural Gas. He also puts his Farm Show earnings toward tuition. In addition to those shown by Tommy and Jamie, Cabot bought hogs from Kayleen and Katelyn Supancik. “Not only does their support allow me to continue to participate in livestock shows, they are helping me to prepare for a successful future,” Kayleen maintains. This year’s Farm Show was bittersweet for Jamie, as she is “aging out” of 4-H. Her focus will now shift to completing her education so she can become a pre-K or kindergarten teacher. She also wants to become a 4-H leader. “This will give me an opportunity to stay involved with a program I love so dearly,” Jamie remarked. Katelyn Supancik, a sophomore at Mountain View High School, looks forward to a number of years yet as a 4-H member. She currently uses the money she earns on her pigs to buy more animals and feed. She noted that Cabot’s involvement with 4-H extends well beyond bidding for pigs. Cabot gives a scholarship to a 4-H member annually, of which her sister, Jamie, was a recipient this year and contributes to the “building fund” for the construction of a new barn at the Harford fairgrounds. “The building project allows for there to be safer facilities for the animals and exhibitors,” Jamie stated. Katelyn appreciates the visits at the fair by Cabot managers and employees who stop to talk with them and ask questions about their animals. “It’s important to support the farmers with which we work so closely and aid in the success of the next generation,” Stark maintained. Meanwhile, the memories of their successful involvement at the Farm Show that still have Tommy, Jamie, Katelyn and Kayleen smiling.